Books, both fiction and non-fiction, play a crucial role in children's discovery of the world and in recent years there has been a veritable explosion in the number and range of 'information books' for children on the market. Remarkably, this slim volume is one of the few books of recent years to seriously address this major topic. Margaret Meek is Emeritus Reader at London University's Institute of Education, yet this is not an academic study but a highly personal view of the way children learn from books - and what books can do to provide children with information - from someone who has clearly thought and cares a great deal about it. This is one of the joys of the book, but also one of its frustrations. Meek includes chapters on such topics as the difference between providing information and providing knowledge, the role of narrative in communicating information, school course books, how book design can contribute to learning and she discusses books about history and the human body. These are all fascinating areas for discussion and she has many valuable insights. She points out, for instance, the fallacy of the idea that narrative cannot communicate factual information effectively: 'For young learners, the shape of a story, the linking of the beginning and the end, creates a reading act. To make this happen, the reader keeps going and thus finds out that reading is a powerful thing to be able to do.' Many publishers of information books, terminally bound to the presentation of information in bitesize chunks, would do well to listen to Meek's insistence on the value of stories in communicating ideas. It is a recurrent theme of Meek's that one of the best ways to communicate ideas and information to children is to stimulate their imagination in a variety of ways. She quotes W H Auden's account of his childhood fascination for geology as his own private, sacred world and suggests that we should 'discover how to let children know that their interests can be widened and diversified by "all kinds of writing" and that we are not repressive about the texts they choose for themselves'. All these things, I believe, are right, but one of the frustrations of Meek's approach is its lack of focus. She allows herself so many little detours into personal anecdote and so many elegant flourishes ('There is a kind of Proustian rightness in the matching and blending of this account with Charlotte Voake's exquisite page designs on just off-white paper . . .') that it is often difficult to follow the overall thread of her argument and the book appears so lightweight that the reader doubts her assertions - especially as she includes little evidence. Many of the examples she does cite are quite outdated. 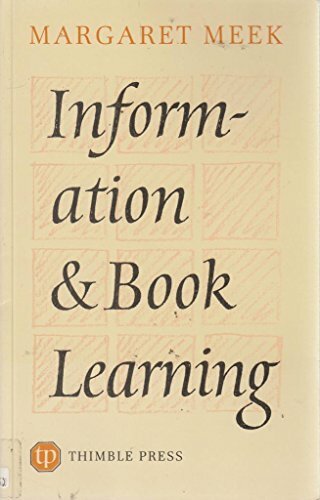 Meek posits (no evidence provided) that information books 'are predominantly male in the conception and presentation of topics and examples', a claim that will surprise the predominantly female editorial teams who create information books. I suspect the notion may be rooted in the cliché that men want hard facts while women are more intuitive; ergo, information books with their factual intentions are by definition male. The waywardness of Meek's rambling text also means that important areas are not addressed. How the need to tailor information books to commercial markets not only at home but abroad is today playing the major part in dictating both their form and cultural stance is a key issue that everyone concerned with how children learn from books needs to consider.